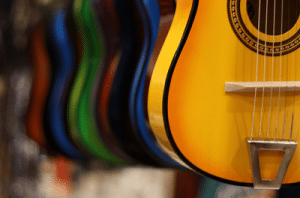 Ukulele tablature – what is it? The benefits of playing a musical instrument are various and more and more people resort to such hobbies to discover new ways of exploring their creativity or using their brains. If you want to engage in the ukulele adventure, you first need to make sure you get a quality starter ukulele as well as all the accessories needed such a ukulele tuner. Once you do so, you can start learning. Finding ukulele lessons is easier nowadays, considering the many resources available online, but regardless of how you want to approach this instrument, you need to start with the basics. And that’s what we focus on today. Although standard notation is universal and thus useful even for ukuleles, it can be a bit tricky to read. Not to mention that, as it is with ukuleles, when you play the same note on different strings, standard notation can ignore important information. That’s why tabs were developed. Intended to overcome such problems, tablatures are designed specifically for fretted instruments. This is not a modern method of notation for such instruments, though. It is believed that the tablature was developed at the same time with the lute and the beginnings of guitar music. What renders the tabs so appreciated is that they make ukulele playing quite easy, given the precision and clarity offered by their structure. They will help the players know exactly where to play a note on the fretboard. Such a tab looks like four lines that are generally created with dashes. Most tabs you will find online are for ukuleles tuned to G-C-E-A tuning. In case the instrument is tuned to another tuning, the tablature will show this because the pitch a string is tuned to will sit to the left of the tablature. The four lines a tab includes stand for the four ukulele strings. What might be a bit confusing at first is that these lines are upside down, which means that the top line or the line that is closest to the floor is the A-string. The line you will see under the top one is the E-string, then the line below the E-string is the C-string, and, finally, the bottom line stands for the G-string. Since you can do much only with these four lines, tabs will also include some numbers that are scattered across the lines. These numbers refer to fret numbers. They will let you know which fret to pluck, which is the great advantage of this specifically designed notation. Keep in mind that you read a tablature from left to right. You can even see a 0, which refers to an open string. This means you play it without fretting any note. The way these numbers appear will tell you more about the note sequencing, too. Thus, if you see the notes placed one after the other horizontally, it means you will have to play them in sequence, which further means that you need to let the first note ring until you play the one that comes next. If the notes are displayed vertically, that is one under the other, it means they should be played at the same time. Tabs might also include symbols at times. Although such symbols are usually used in guitar tabs, you might find them in uke tabs as well, and knowing a bit more about them is thus required if you intend to advance. You will thus find the so-called hammer-ons, which are represented by an “h”. When you see such a symbol, you will have to pluck the note before it and then press the one that comes after it. While the hammer-on separates two different notes, the pull-off does the opposite. In case the tab shows the “^” symbol, it means you will have to combine the two methods. Other symbols include slides that can be ascending “/” or descending “\” as well as bends represented by the “b” symbol. As far as chords are regarded, they are written just like simultaneous notes and include fret numbers on the four lines that represent the strings. In order to let you know that you have to strum chords, a tab will include arrows that will indicate the direction of your strumming. Just remember that an up arrow will indicate a down strum and vice versa. Here is the downside of tabs. Reading tabs is easy yet the problem with them is that it might be difficult to know what the rhythm is. Without extra help, you will have to rely on the way you heard the song you want to play in order to know when to play the notes. Thus, the tab will become an aid and you will need to listen to that song carefully to get the tempo and the rhythm. However, the best way to overcome this issue is to use the tab in combination with sheet music. There are online sources that provide tabs written along with the sheet music so you can know how to play the rhythm, which means you need to know how to read rhythm on such a sheet. You can even find tablatures that are divided into measures, yet they are not very common. Some tabs can even include the rhythmic stems of the notes you find in traditional sheet music, only that they are written above the tab. There are many websites that offer tabs and chord charts for all levels. Some of them are accompanied by videos that provide detailed explanations and show you what to do with the information offered by a tab. Whether you want to play ukulele professionally or just for your own delight now and then, you can always go for one of the paid lessons available online. Doing so will help you learn this instrument step by step through a structured program.